Joe Gibbs Driven HR-3 synthetic high performance motor oil provides excellent protection for blown marine engines and air-cooled engines. Using oil additive technology developed for the US military's combat equipment, this oil's high zinc content delivers proper anti-wear protection for older-style pushrod and flat-tappet engines. The same chemistry that's found in Joe Gibbs Driven racing oil and has powered Joe Gibbs Racing to multiple NASCAR championships offers superior camshaft wear protection. 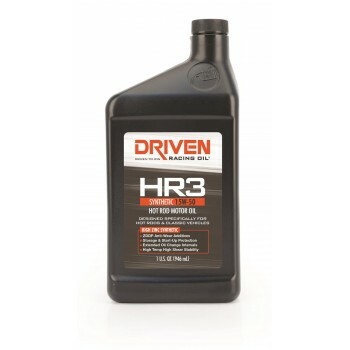 Joe Gibbs Driven HR-3's synthetic formula provides improved cold-start protection compared to mineral oils.